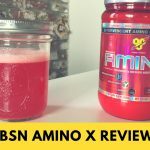 Home » BSN AMINOx Review — Can It Really Help Endurance? BSN AMINOx Review — Can It Really Help Endurance? BSN, which stands for bio-engineered supplements and nutrition, is an Illinois-based supplement company that sponsors a wide variety of athletes and bodybuilders, most notably UFC champion Connor McGregor. They have a couple of amino acid supplements, but AMINOx is a little unusual in that it has no caffeine and it contains a significant amount of Vitamin D, in addition to supplement mainstays like taurine, l-alanine, and l-citrulline. It comes in five flavors, and we decided to take Fruit Punch for a test drive. Click HERE to shop BSN. 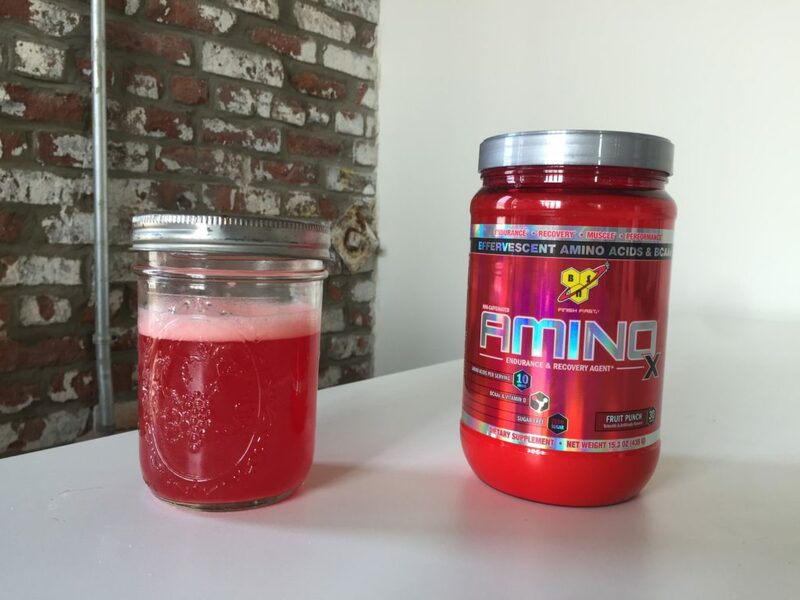 First, let’s talk amino acids: there are ten grams per serving, which is a lot. Most brands provide about five grams. The problem is that this is a proprietary blend, so we don’t know how many of each amino acid it contains. That’s a big deal, since it’s not unusual for athletes to deliberately seek out a 2:1:1 or 3:1:1 ratio of leucine, valine, and isoleucine in their BCAA supplement. AMINOx has these (and they’re in that order) but it’s a bad idea to exclude their precise weights per serving. 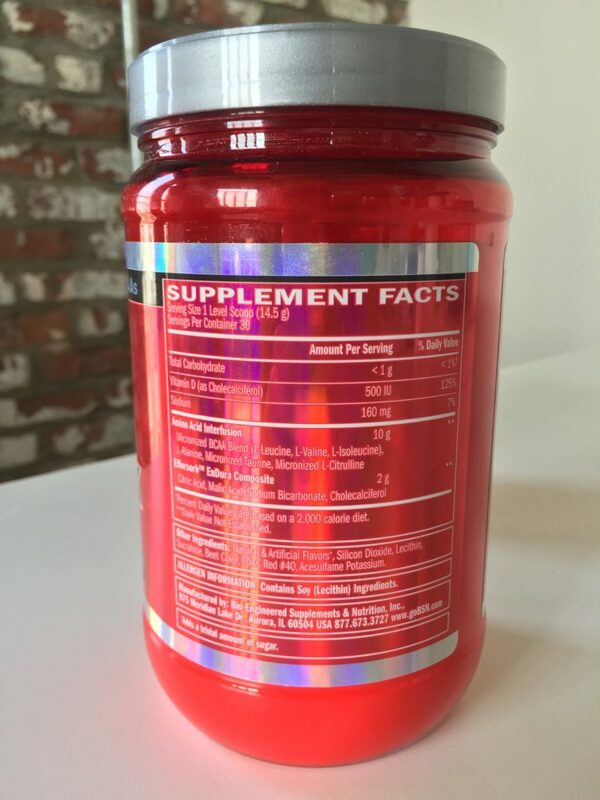 These three amino aids are followed by l-alanine, taurine, and l-citrulline, and then there’s a mixture of citric and malic acid, sodium bicarbonate, and cholecalciferol. I’ll discuss the benefits of these ingredients in the section below. There are also artificial flavorings, colors, sweeteners, anti-caking agents, and some soy lecithin for mixability, too. You can grab 30 servings for $20, which is 66 cents a serving. That’s on par with all the cheaper BCAA supplements like GNC and Scivation’s Xtend. But with 10 grams of amino acids per scoop, this has a much larger serving size. I’d like to say that means it’s better value for money, but since BSN doesn’t include the weight of their amino acids in each serving, I can’t tell you if you get more BCAA per serving than you do with their competitors. I’m yet to see a BCAA supplement that doesn’t include L-leucine, L-valine, and L-isoleucine, which may improve endurance and prevent muscle breakdown. These are present in AMINOx, but they’re followed by l-alanine, which might boost nitric oxide (though this hasn’t been definitively proven); taurine, which may improve recovery and reduce muscle cramps; and l-citrulline, which may improve circulation. Unlike glutamine and arginine, there’s a decent amount of science behind these additions, so it’s nice to see them included. Then there’s “Efforsorb™ EnDura Composite,” a mixture of flavorings (citric and malic acid), sodium bicarbonate (which may boost endurance), and cholecalciferol, which provides the 125 percent of the recommended daily intake of Vitamin D. This may improve bone strength and hormone production. There’s also 160mg of sodium, which is an electrolyte. 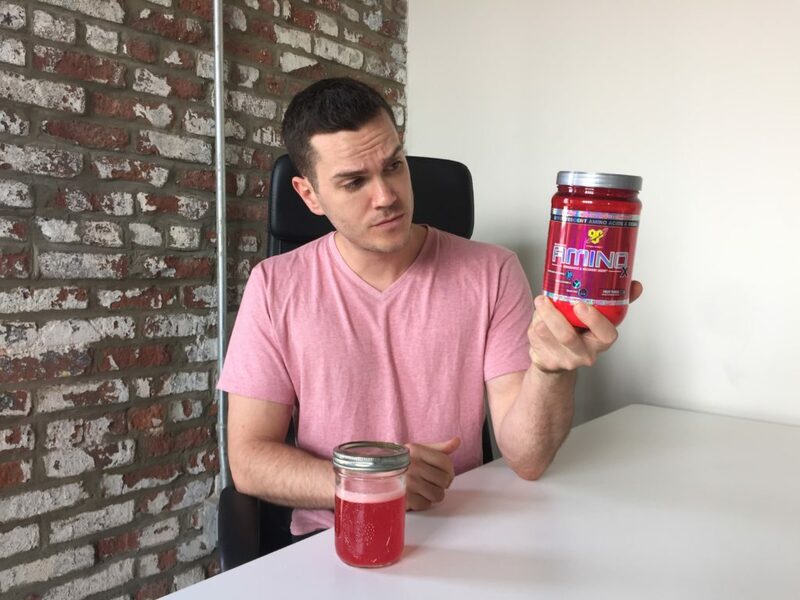 The fruit punch tasted just like other fruit punch-flavored BCAAs — which is artificial cherry and watermelon flavor — but it was much more intense. In a cup and a half of water, one serving was still overwhelmingly sweet and sour, so make sure you mix it with at least two or three cups if you can. AMINOx has plenty of science behind it, providing the main BCAAs in addition to several extra amino acids that have been shown to confer multiple benefits that can improve workouts. It’s also extremely cheap if you’re looking at the cost per gram of BCAAs. The biggest issue is that the amounts of each amino acid aren’t provided, so you can’t be sure if you’re getting an effective dose. You also may be put off this product if you dislike soy or artificial sweeteners, but if you don’t mind them — and you don’t mind not knowing the ratio of BCAAs you’re consuming — then this is a pretty reasonable pick.